Mission Cultural Center Invites you join the 2018 Carnaval Parade contingent with live Latin & Caribbean music! 1st place winner of 2017 SF Carnaval Caribbean Category! 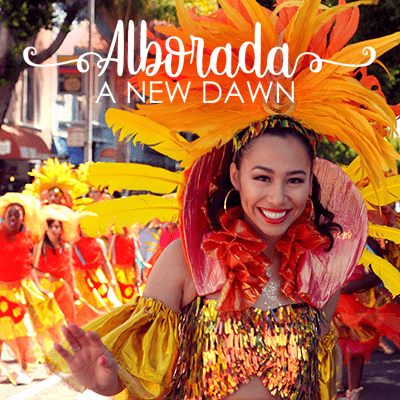 MCCLA’s Comparsa “Alborada (A New Dawn)” is gearing up for another spectacular performance. Diana Aburto, a seasoned and talented Nicaraguan dancer, will be leading this year’s contingent. The choreography blends the music from Nicaragua and the coastal Garifuna groups with rhythms of Cumbia, Vallenato, Punta, Palo de Mayo, and of course, some Salsa. Come check us out next Saturday and join us! Registration fee – $35. Once you pay the registration, you’ll only pay $8 per CLASS. Raffle Tickets – Really cool prizes! We will distribute tickets next Saturday at the class. We hope you join us this year, and become, once again, part of this wonderful and magical experience! Would you take 5-10 minutes to fill out our Carnaval 2018 Survey? View past Carnaval events here!